At least 11 people have been killed in the Moroccan capital Rabat, following a stampede at a world music concert. 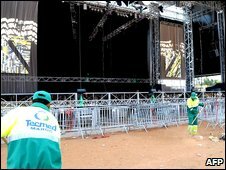 Some 40 were injured when a wire fence collapsed at the Mawazine festival. The incident happened on Saturday night, when some 70,000 spectators were packed into the Hay Nahda stadium to see Moroccan singer Abdelaziz Stati. The nine-day-long event has featured such international stars as Kylie Minogue, Algerian rai singer Khaled, Alicia Keys and Stevie Wonder. Analysts say the nine-day-long Mawazine festival is one of several events aimed at promoting Morocco's image as a modern, tolerant nation. But some of the country's Islamist politicians have denounced the concerts as encouraging immoral behaviour. The festival was drawing to a close when the stampede occurred. Shortly after midnight on Sunday morning, thousands of spectators hurried to leave and a wire fence toppled over. According to police, five women, four men and two children died in the ensuing crush. Governor of Rabat Hassan Lamrani blamed the stampede on an attempt by some concert goers to rush out of the stadium by jumping security fences. "At the end of the concert and despite the existence of seven gates, a group of citizens decided to go over the metal barriers to have a quick exit," Mr Lamrani said. But one of the dozens of concert-goers injured in the crush told Reuters news agency police were partly responsible for the incident. "The doors were closed by the police and we were forced to leave the stadium from some places not destined for this purpose. The police did not intervene." Rescuers helped to pull out survivors and transport the injured to hospital, where seven people remain under observation, according to AFP news agency. Deadly crowd stampedes in Africa are usually associated with sports events, according to BBC North Africa correspondent Rana Jawad. 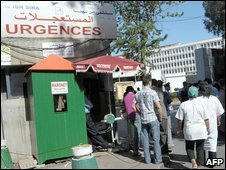 But this is the second known incident of its kind in the region; in 2007 a stampede at a concert in Tunisia killed seven people.